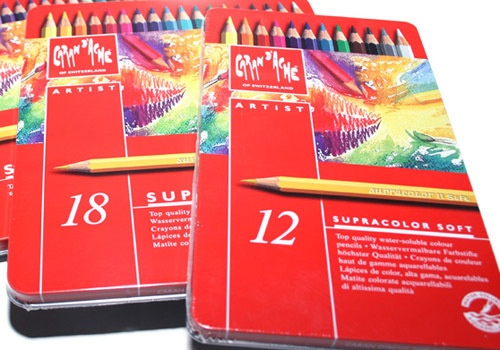 Neocolor II water-soluble wax oil pastels highlight the enormous innovative capabilities of the Maison Caran d’Ache. Created in 1972 as the continuation of the famous Neocolor I range, they offer boundless creative possibilities for artists and beginners alike. Basing their work on the existing excellent qualities – exceptional coverage, smoothness and extreme lightfastness –, the craftsmen of the Manufacture added water solubility, a property greatly appreciated by connoisseurs of the Maison from all manner of artistic fields and from school age upwards. Neocolor II can be used for all forms of creativity, ranging from drawings on dry or wet materials, monotypes, impregnation, wet drawing, glazing, rainbow gradation and facepainting. With 84 colours, the entire range offers almost unlimited scope for the imagination, to the point where even experienced artists once more see things through the eyes of a child, thereby liberating the purest of all creative energies: that of the sheer wonderment evoked by colours. Swiss Made. Neocolor II pastels are entirely developed and crafted in the Caran d’Ache workshops, according to the highest quality standards and in compliance with environmental norms and certifications. We stock the following 84 colours in open stock. Sorted by colour name. Supracolor Soft Aquarelle pencils offer a huge range of water-soluble colour leads in 120 finely nuanced shades. Designed for every creative profession, the Supracolor Soft range offers a wide variety of applications thanks to intensely luminous colours and excellent covering power. While designed for large, broad works, the soft, large-diameter 3.8 mm leads are nevertheless extremely robust and display exemplary lightfastness, while their colour opacity and pigment quality ensures long-lasting use. Pencil drawings can thus be faded out, blended with fingertips, textured by rubbing the lead on a piece of sandpaper or used as watercolours. The body of the pencils is completely varnished and sheathed in a glossy colour corresponding to the colour of the lead. Swiss Made. Supracolor Soft pencils are designed and manufactured in the Geneva workshops of Caran d’Ache according to the quality standards of the Swiss Made label and in line with eco-friendly standards and certifications.